The sales executive was extremely helpful and informative throughout the whole process. We didnt even know the car we chose existed but he listened to the facts that we had a set budget but needed a roomy boot for our labrador. The car is perfect for our needs. All the staff at Bristol Street Motors Seat Derby have been friendly and helpful. The team was helpful and we believe we got a really good deal from them. The team managed to sell us our perfect car without the old cliche of pushy sales people who are outdated. Selling with honesty and excellent customer service is a win win. The sales executive is clearly a valued member of the team, but I'm sure you already know that. THANKS SEAT TEAM DERBY. In the market for a new SEAT Alhambra? Browse our extensive range of new SEAT Alhambra cars for sale and find our latest deals at your local Bristol Street Motors SEAT dealership. 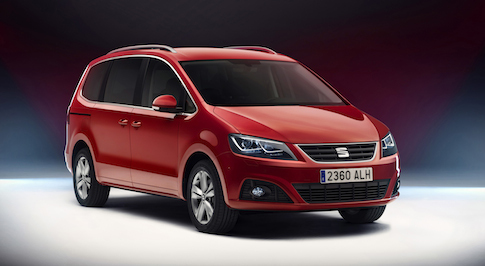 The Seat Alhambra is one of the best MPVs on the market, with an incredibly spacious interior and practical for families with 7 seats. The driving experience offered by the Alhambra is refined at all seeds, with a 2.0-litre TDi engine that powers all models is efficient and economical. The interior is well built and with a maximum boot capacity of 2,297 litres, it is able to carry whatever you need to carry. The range topping SE Lux trim comes with powered side doors and a powered tailgate. Experience the SEAT Alhambra for yourself at your local Bristol Street Motors SEAT dealership.